Radiation curable formulations, used in coatings, inks, adhesives, and electronics, are cross-linked by high-intensity ultraviolet light or electron beam energy sources. The coating formulations differ from those used in conventional paints and coatings in that the diluent (solvent) and resin (film former) used in thermally cured coatings are replaced by a reactive liquid vehicle in which a pigment and other additives may be dispersed or dissolved. 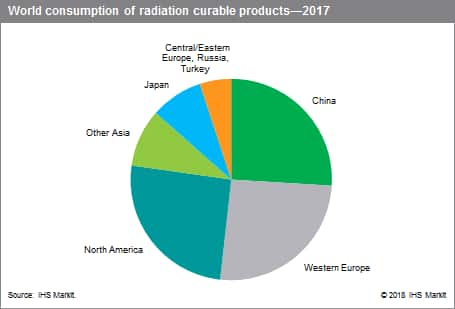 Radiation curable products are used for a wide variety of applications, which vary in importance from region to region. In North America, the graphic arts sector (which includes overprint varnishes and inks) predominates, with coatings, adhesives, and other industries being of lesser importance. In Europe, the wood coatings and graphic arts markets account for about 80% of demand. The situation is different in Asia. Radiation curable film resists, printing plates, semiconductor resists, and color filter resists are used extensively for semiconductors, printed circuit boards, printing plates, and other components. In Japan, these uses account for 20–30% of the total market for radiation curable products. In India, about 80% of radiation curable products are used by ink manufacturers. In China, the major uses of radiation curable products are in wood, bamboo, paper, and plastics coatings. UV/EB technology is used in a variety of industrial segments such as graphic arts, packaging, wood furniture, fiber optics, electronics, building panels, and automotive parts. UV light can come from mercury lamps, xenon lamps or light emitting diodes (LEDs), or EB energy starts a photochemical reaction in coatings, inks, or adhesives. These formulations are based on monomers, oligomers, photoinitiators, and additives, although spray applications generally require the use of organic solvents or water as a diluent to reduce viscosity. Radicals or cations, formed from the reaction of the radiation with the photoinitiator, act as catalysts to solidify, dry, harden, polymerize, or cross-link the liquid formulation. When the layers become thicker and more pigmented, EB accelerators can be used for curing coatings without photoinitiators. 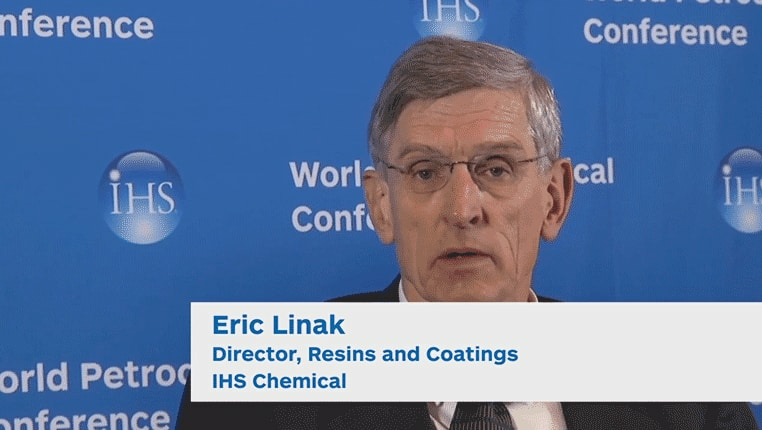 Radiationcured coatings have gained importance, being favored by environmental regulations and technology developments compared with other coatings. Waterborne UV coating systems as replacements for solventborne systems. Portable curing systems, which allow the application of radiation curable coatings at job sites, especially wood and concrete floor refinishing. Inkjet inks, which are deposited on textiles, magazines, and other goods on a short-run or custom basis. Formulations cured by exposure to UV LED curing lamps, which are more energy efficient and environmentally friendly than conventional mercury lamps. Stereolithography, a process where 3D parts are produced from photosensitive resins. The major use so far is in the manufacture of prototypes for medical and electromechanical systems. There is interest in producing small-scale production volumes as well. Printed electronics, which include any electrical device that is manufactured by printing. UV curable inks and coatings are being developed that have the potential for widescale use in portable photovoltaics, electroluminescent displays, transdermal patches, and organic light emitting diodes (OLEDs). Coil coatings, which are applied to strips of metal coil processed at very high speeds. Automotive OEM coatings on interior plastics and textile use. UV radiation curables are already well established as coatings for headlamps. Coatings formulated with nanoparticles, which improve certain properties like hardness for clear wood coatings. Renewable raw materials, such as epoxy acrylates made from soybean oil or polyester acrylates made from dimerized fatty acids obtained from soybean or tall oils. In recent years, the radiation curable industry has grown at rates higher than those of the overall coatings and inks markets. During the next five years, consumption of radiation curable coatings is expected to grow at an average annual rate of 4.5%.